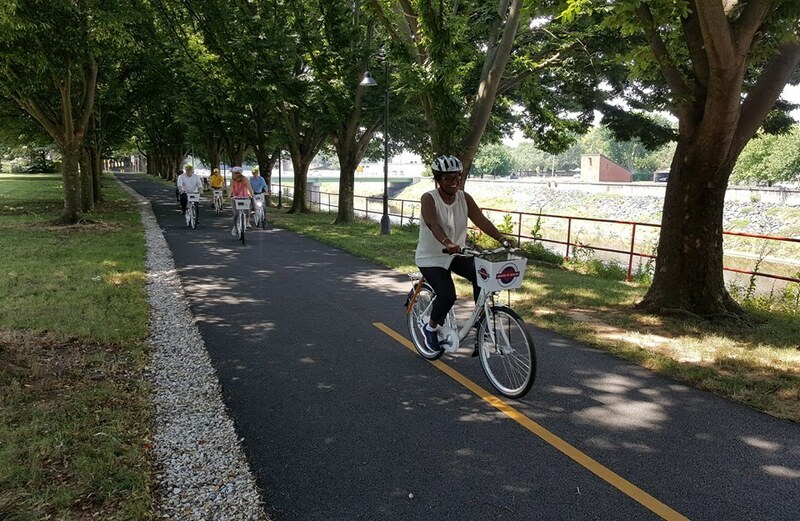 The City of York, York County Department of Parks & Recreation and Downtown Inc announce that the 1.4-mile portion of the York County Heritage Rail Trail improvement project is complete! The bituminous surface from Lafayette Plaza to Kings Mill Road was repaved, with porous bituminous pavement being installed from Kings Mill Road to Grantley Road. Improvements were also made to the grading and storm water management facilities, and more than 100 new LED light fixtures were installed along the corridor. Funding for this City of York project was provided by a Pennsylvania Department of Conservation and Natural Resources (PA DCNR) grant, with local matching funds provided by 19 local businesses and organizations. General project coordination on the Rail Trail reconstruction was provided by Downtown Inc. The General Contractor on the project wass Shiloh Paving & Excavating. Engineering and inspection on the project was provided by C.S. Davidson and Buchart Horn. For future project updates and progress, the public is encouraged to follow Downtown Inc on Facebook (www.facebook.com/downtownyorkpa.com) and Twitter (@downtownyorkpa). Additional questions can be directed to Downtown Inc, 2 East Market Street, York, PA 17401. The public can call (717) 849-2331 or email info@downtownyorkpa.com.